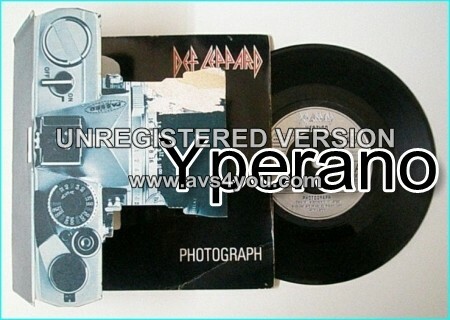 Def Leppard Photograph / Bringin’ On The Heartbreak 7″ Camera Sleeve 7″ second hand hence the reduced price. Camera shaped, fold out, pop up sleeve. 500 only limited edition. This version of the 7″ single has a camera on the cover, that pops up and you can see a picture of Marilyn Monroe. One of Def Leppards best songs, I love everything about it. The person in the photograph he wants is Marylin Monroe. Either Joe Elliot or the entire band had a crush on her. I know this from reading an interview, and hell, shes in the music video. Pretty evident that the guy is obsessed with a celebrity. The first lyrics “I’m outta love, outta luck”…seem to indicate he is obsessed to the point he cannot enter into a tangible relationship with a real person. Def Leppard wasn’t just another one hit wonder of the 80s. In my book, they were and are Rock n’ Roll Gods! This is a great song, and well written. In the 80s alot of people came and went, but you know what? Def Leppard came, and they’re still here with us. In 2006 the song was used in promotional ads for the DVD release of Blades of Glory. In 2009 it was named the 13th greatest hard rock song of all time by VH1. It was also listed as the No. 17 greatest song of the past 25 years by VH1. The 1993 live recording of the song in Sheffield, England appeared in the music video game Guitar Hero III: Legends of Rock as part of a Def Leppard downloadable track pack, as did the 1993 live recording of “Rock of Ages”. The song was also included in the tracklisting of the rhythm music video game Battle of the Bands. In 2008 they performed the song with country pop singer Taylor Swift on CMT Crossroads. Joe Elliott commented on the Vault album that this song was a big hit in the US and that he felt disappointed that it didn’t become a hit in the UK. Nationally syndicated sports talk show host Jim Rome commonly refers to “Photograph” as one of the all time great rock songs ever. There are two versions of the music video. The uncensored version shows a knife scene at the beginning, and on the censored version of the video, it is almost the same except the knife scene is replaced with a stationary black cat among other minor bits removed. There are several appearances of a look alike impersonating Marilyn Monroe in the video, as the song is actually about the star and lead singer Joe Elliotts declaration that he doesn’t just “want [her] photograph” but that that is all he has of her, and he must admire her from afar. The music video was directed by David Mallet and was shot on Thursday, 2 December 1982 (bassist Rick Savages 22nd birthday), in Battersea, London, England. It featured the video debut of guitarist Phil Collen. This is about a chick who is draining the guy. And it seems he is doing his best to make it work, but it isn’t good enough for her. Shes always looking for something more. Does this mean she is bringing him heartache or she is bringing it upon herself for not seeing (“Can’t you see …”) that hes giving her his best? Its difficult for me to ascertain, now that I think about it, if this song is about a guy whos being drained by the relationship or a girl whos ruining the relationship on her own by pushing him away. Shes “like a candle,” burning him and burning out at the same time. So, shes hurting her guy with the self-destructive behavior. SKU: YP-1811 Categories: All Genres, Hard Rock, NWOBHM, Pop, Rock, Search by Media Type, 7", NWOBHM 7"